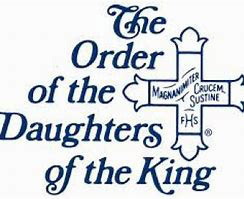 The Daughters of the King is a religious order of women who pledge themselves to a life-long program of prayer, service, and evangelism, dedicated to the spread of Christ’s Kingdom and the strengthening of the spiritual life of their parish. It is of Anglican tradition and includes Episcopal oversight, but extends membership to women from Lutheran and Roman Catholic churches. Christ Episcopal Church has a chapter of the Daughters of the King called “Christus.” We can be recognized by the Order’s emblem we wear daily, a silver modified Greek Fleury cross inscribed in Latin, “Magnanimiter Crucem Sustine, “With heart, mind and spirit, uphold and bear the cross.” At the base of the cross are the letters “FHS” which stand for “For His Sake.” Meetings of the Christus Chapter are held the third Sunday of each month at 11:45 and are open to all women of Christ Church.